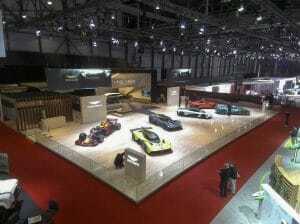 At the last Geneva Motor Show, one of the most impressive stands was unquestionably that of Aston Martin. The display highlighted the different models based on its new range of mid-engined supercars designed in collaboration with Red Bull Racing. Four cars which are different but have a closely related shape form the line-up of forthcoming sports coupés at the top of Aston Martin’s range. There are so many models proposed and they appear so similar that we need to take stock of all these projects, which have quite different vocations. It all began at Silverstone in July 2016. 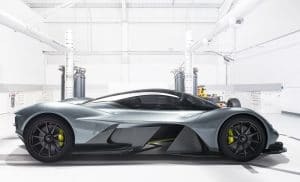 That year, alongside the British Grand Prix, Aston Martin unveiled its project AM-RB 001, an extraordinary machine designed in cooperation with Red Bull Racing. The work was led by Adrian Newey, the designer of several Formula 1 championship-winning cars for Williams, McLaren and Red Bull. Aston Martin did not divulge any technical details but announced that production would be strictly limited to 150 cars. In January 2017, the RB 001 made a stealthy appearance when it was previewed at the Festival Automobile International in Paris. 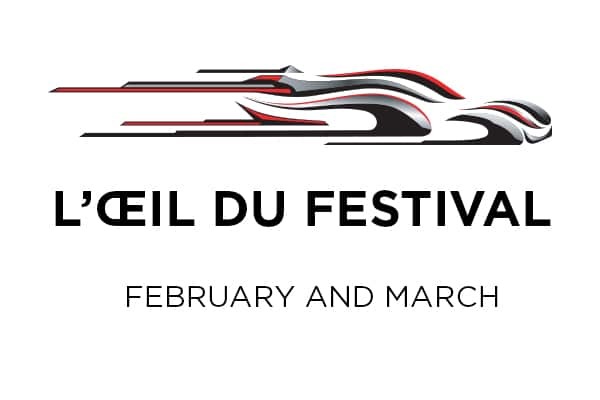 In March 2017, the RB 001 was shown on Aston Martin’s stand under its new identity: the Valkyrie. A year later, at the 2018 Geneva Motor Show, the Valkyrie adopted a more sporting appearance in the Valkyrie AMR Pro version presented in the fluorescent yellow livery of the competition Aston Martins. This version was reserved for track use with “performance worthy of a car from the LMP1 category”, the manufacturer claimed. 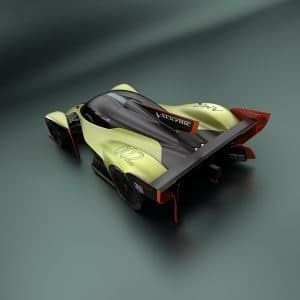 For the first time, some figures were given: the Valkyrie AMR Pro would receive a hybrid powertrain developing a total of 1100bhp and be equipped with a majestic 6.5-litre V12. Production would be limited to 25 cars, with deliveries due to start in 2020. 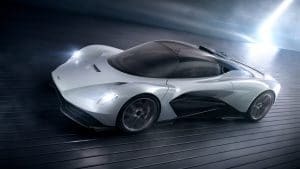 In January 2019, Aston Martin provided further details of the Valkyrie and confirmed its role as a supercar with extensive opportunities for personalisation. The programme “Q by Aston Martin” offers a huge number of possible choices of optional equipment, colours and materials. It will also be possible to specify the Valkyrie with the extreme “AMR Track Performance” pack which will optimise its aerodynamic equipment, running gear (magnesium wheels), suspension and braking system (titanium discs). The Valkyrie (shown in matt grey), with more details available of its engine, a 65° V12 with a capacity of 6.5 litres built by Cosworth, developing maximum power of 1000bhp at 10,500rpm and peak torque of 740Nm at 7000rpm. This is combined with an electric drivetrain supplied by Rimac and Integral Powertrain Ltd., adding 160bhp to give a total of 1160bhp at 10,500rpm and 900Nm of torque at 7000rpm. The Valkyrie AMR Pro (fluorescent yellow), confirming the model shown at Geneva in March 2018. 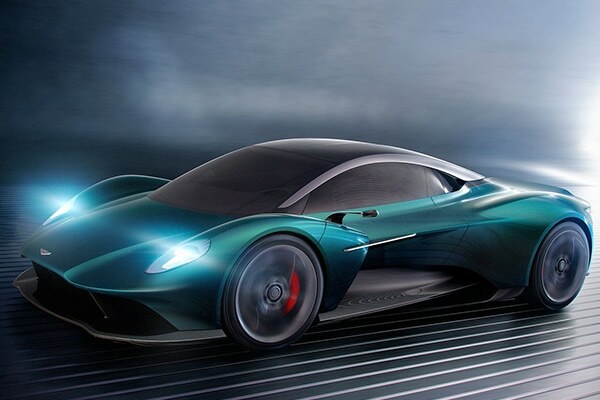 The AM-RB 003 (sky blue): in September 2018, Aston Martin had announced Project 003 to follow 001 (renamed Valkyrie) and 002 (now known as Valkyrie AMR Pro). 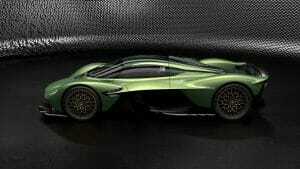 In March 2019, Project 003 was unveiled and became the AM-RB 003. 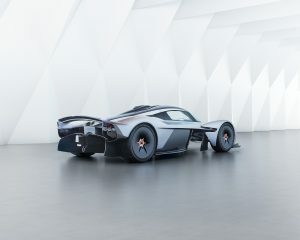 With its market introduction planned for 2021 and production strictly limited to 500 cars, the AM-RB 003 benefits from the lessons learned from the Valkyrie but will be less exclusive and will be fitted with a hybrid powertrain based on a V6 turbo. The Vanquish Vision Concept (green): on the face of it, this concept car was conceived along the same lines as the other mid-engined models. Its vocation, however, is not the same. Unlike the Valkyrie and RB 003, the Vanquish Concept is built on an aluminium rather than carbon-fibre chassis. 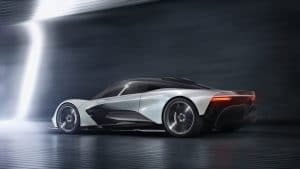 It is not planned to go on sale until 2022, so figures will only be disclosed at a later date, but it is already known that the powertrain will be based directly on that from the RB 003, with a naturally aspirated V6. Given the name assigned to it, the Vanquish should take up the baton from the front-engined Vanquish, which was launched in 2012 and was replaced by the DBS Superleggera in 2018. All these models are in the same vein, sharing their overall architecture and a common style. They were all developed under the direction of Fraser Dunn, the chief engineer responsible for advanced operations, working closely with Red Bull Advanced Technologies. 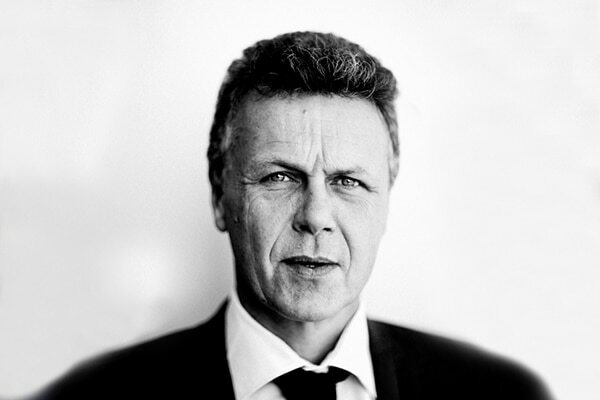 With regard to their design, all the work was handled by the design director, Miles Nurnberger, under the leadership of Marek Reichmann, the Executive Vice-President in charge of design at Aston Martin. While discreetly fostering a family resemblance, each car’s individual vocation is suggested by subtle variations ranging from the gentle to the aggressive.